I originally rated this climb a 5/10. What was I thinking! Returning to ride it for the first time in five years I can only conclude that I must have had a huge tail wind, as it’s definitely a seven. 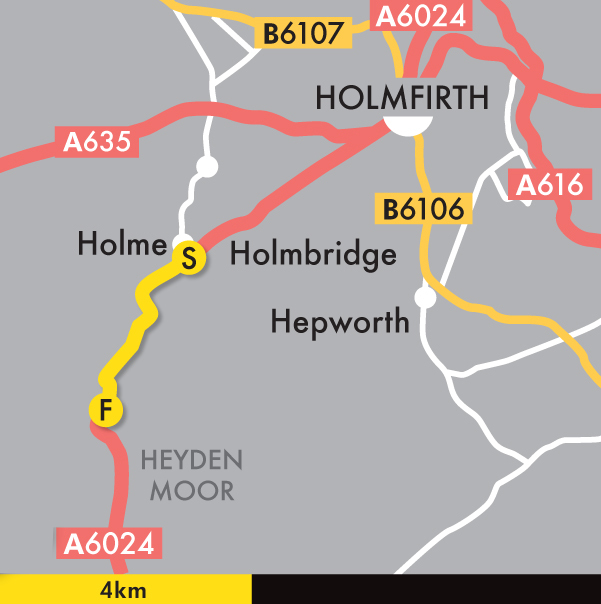 Holme Moss won’t decide the winner of the day’s stage but it will shake things up and could provide the launch pad for a serious attack. Leaving Holmfirth on the A6024 you climb hard through Hinchcliffe Mill and Holmbridge, but I measure the actual ascent of Holme Moss from the small bridge just past the exit of Holme. Being a major route across the Pennines the road is wide, well surfaced and covered with warning signs. You’re bombarded with signals to slow, arrows marking direction and more usefully, markers counting down the distance to the exposed summit. Starting from one mile to go, these marks on the road will take you all the way to the ‘finish line’ acting as carrots to aim for as you grind, or if you’ve good legs, spin up the solid, unrelenting 10-12% gradient. Where head east from the centre of Holmfirth on the A6024. Pass through the villages of Holmbridge and Holme then begin to climb as the road bends left over a bridge.